Following violent clashes in Beirut, thousands of the Free Patriotic Movement’s supporters rallied peacefully in the Lebanese capital, calling for presidential elections and demanding solutions to the crisis that has crippled the country’s political system. 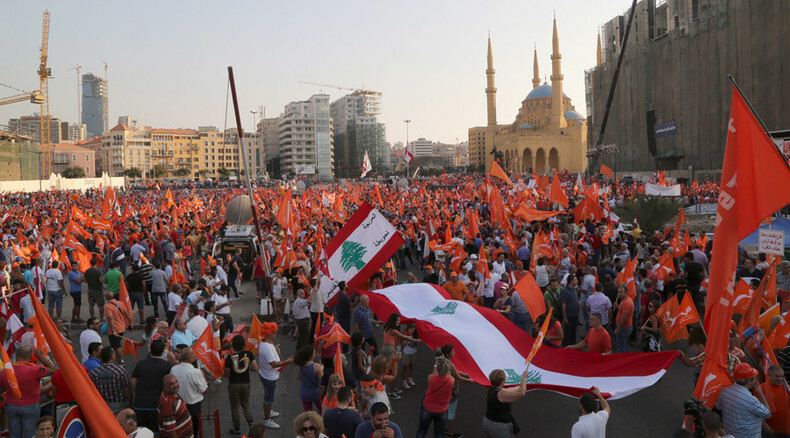 Thousands of supporters of the movement’s Christian faction leader, Michel Aoun, descended on Martyr’s Square, carrying their Free Patriotic Movement orange flags, as well as those of Hezbollah. “It should be a revolution! We had enough of dirty! We want a clean person!” one emotional supporter of Aoun told RT. Demonstrators who gathered on Friday come from all segments of Lebanese society and are demanding parliamentary elections and a popular vote to elect a president. The rally was staged ahead of a protest by a ‘You Stink!’ coalition that is also calling for the resignation of the current cabinet, or at least the environment minister. “Regarding the You Stink movement, we have similar demands, but they are not as organized as us and we have a list of demands with priorities,” one activist from the Free Patriotic Movement told RT during the rally. The ‘You Stink!’ movement germinated over trash piled up on the sidewalks of Beirut in August. The government had closed a main landfill and suspended garbage collection. The movement put forward political demands, and several of their gatherings resulted in violent clashes with police. In a country where the president is elected by parliament, the rift inside the political arena has hindered their ability to choose a new leader since Michel Suleiman’s mandate expired in May 2014. “The deputies and the government are not legitimate as they are not based on elections,” another activist told RT at the demonstration. Following Lebanon’s 15-year civil war, a power sharing system emerged where the prime minister is a Sunni, the president a Maronite Christian and the parliament speaker a Shiite. But following the start of the Syrian civil war political arrangements in Beirut started unraveling, with people dividing over party lines. Some experts warn the issue over garbage collection and the demonstrations could be hijacked by extremist forces. “We have to keep in mind considering its political history, there is a danger of this conflict spilling into violent groups trying to take advantage of this conflict,” Robert Naiman from the think tank Just Foreign Policy told RT. More than 1 million Syrian refugees that have poured into Lebanon are continuing to impact sectarian tensions in the fragile Mediterranean country. “What should we say about Lebanon and how Lebanon was destabilized by the refugee flow from Syria and the carefully constructed political compromise being threatened by the sectarian conflict in Syria?” Naiman asked.